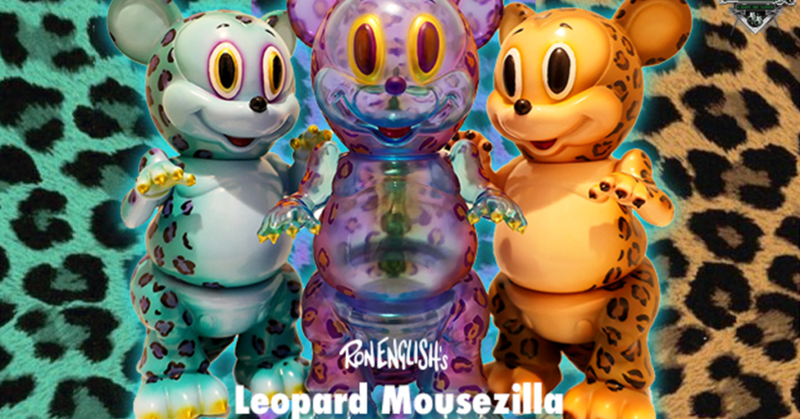 Leopard Mousezilla by Ron English x Blackbook Toy! Blackbook Toy have hand painted via a mixture of dry brushing & air brush leopard prints on Ron English’s Mousezilla. In total BBT have painted 6 pieces (4 in beige, 1 in light blue and 1 in clear blue). One of the Beige has been gifted to Ron himself, so only 5 pieces will be available for purchase via lottery starting at 3pm (UK) on Thursday 21st Feb. Each Mousezilla is 9inches tall and priced at 16200YEN (£112). Winners will be shipped a random colourway from the colours remaining.